I always used my neighbour’s gas-powered chainsaw, but after we moved to another house I couldn’t borrow it anymore. With a shipment of wood coming in I started looking for a chainsaw. I finally found the best electric chainsaw which performed really well. In this review, I will explain why I have chosen an electric chainsaw and not a gas powered one. I will also review some of the best electric chainsaws on the market. So the first question or decision I had to make was electric vs gas powered. I started looking for a gas powered, simply because I thought that electric chainsaw wouldn’t be strong enough. Gas powered chainsaw give you freedom, you don’t need electricity and they tend to be more powerful. But they are also a lot heavier and make a lot more noise. Living in a suburban area I would have to keep my new neighbours in mind too. Another advantage of a electric chainsaw is that they always start immediately. 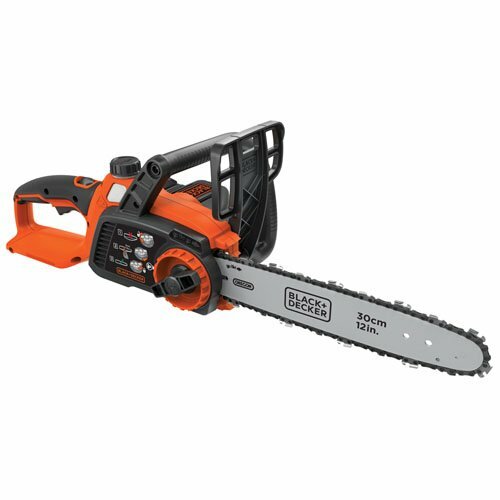 Also, the prices of gas-powered chainsaws are much higher, so I started looking for the best electric chainsaw. While looking into the electric chainsaw you will see that you that are cordless electric chainsaws as well. Having a battery will give you the freedom back, you can take the chainsaw into the wood, not having to worry about an outlet. But a battery only lasts an hour max so it will really cut down the amount of work you can do. With a cord, you won’t have this limitation of course. If you are going for battery powered chainsaw I really recommend going for one brand with your other battery powertools. This way you can share the batteries, so if you have to cut a lot of wood, you can use the battery of your other power tool. Choosing between a battery or cord really depends on the type of jobs you are doing. If you are just like me only want to cut some logs in smaller pieces then a cord is a far better choice. But if you want to take the chainsaw out in the woods, or you have a really large property then a battery is more convenient then dragging 200 feet of cord behind you. So during my research, I looked at different models, read a lot of reviews from other users and tested some chainsaws out from friends. Below you will find a short list in what I believe are the best electric chainsaws. At the end of this article, you will find a comparison table so you can easily compare the different models. I have chosen for the Worx WG303 based on the price and specifications. This chainsaw has a good weight, only 11 pounds, and is really powerful. The electric motor produces 3.5 hp which is more than enough to cut down a tree with an 18″ diameter. The blade has a length of 16″ which is enough to cut down normal trees to cut a log into smaller pieces. Another advantage of the Worx WG303 is that it has a really low tip kickback making it a really nice tool to work with. The auto-tensioning system is working great. The Worx is a bit oil thirsty, so make sure you keep an eye on the oil level. If you are looking for a cordless electric chainsaw then you should really look into the Black & Decker. It’s a bit expensive maybe, but the 40-volt battery will give you a much more power run time than the 20 volts. The chain speed of a 40-volt is around the 5 m/s where a 20 volt is around the 3.5 m/s. With continues use the battery will last an hour. If you have other Black & Decker tools you can change the batteries out, so you can charge one and continue the work with another battery. The Black & Decker has just like the Worx an automatic oiling system. It doesn’t have an automatic tensioning system, but it’s tool-free. 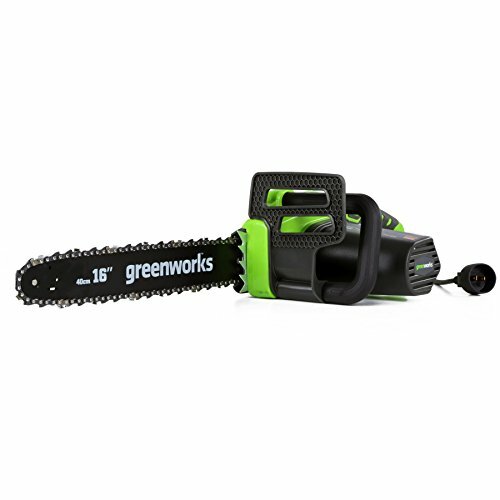 Another option for a corded chainsaw is the Greenworks 16-inch electric chainsaw. It’s lighter than the Worx and a little less powerful, only 12,5 amps compared to the 14.5 amps from the Worx. The Greenworks also has an automatic oiling system, but the amount of oil left in the reservoir is a bit harder to see. No auto-tensioning, but it’s tool-free. So you can just rotate the wheel on the side to tension the chain. Includes Battery indicator for quick Battery life review. 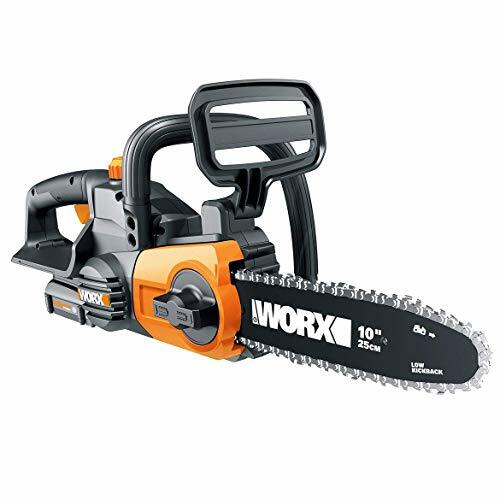 Worx also made a really good cordless electric chainsaw. This one is a little bit smaller, with only a 10″ blade, making it ideal for cutting of branches and cutting down small trees. Just like the other Worx comes the WG322 with an auto-tensioning system. So your chain is always it the right tension. The 20V battery won’t as long as a 40V battery, only about 30 minutes. So having a second battery at hand is really a must here. Charging the battery can take up to 4 hours. With a weight of 6 pounds is this a really light and easy to use electric chainsaw. To help you with selecting the right electric chainsaw I added a comparison chart so you have all the details in a clear overview. As you can see the best electric chainsaw isn’t really expensive. 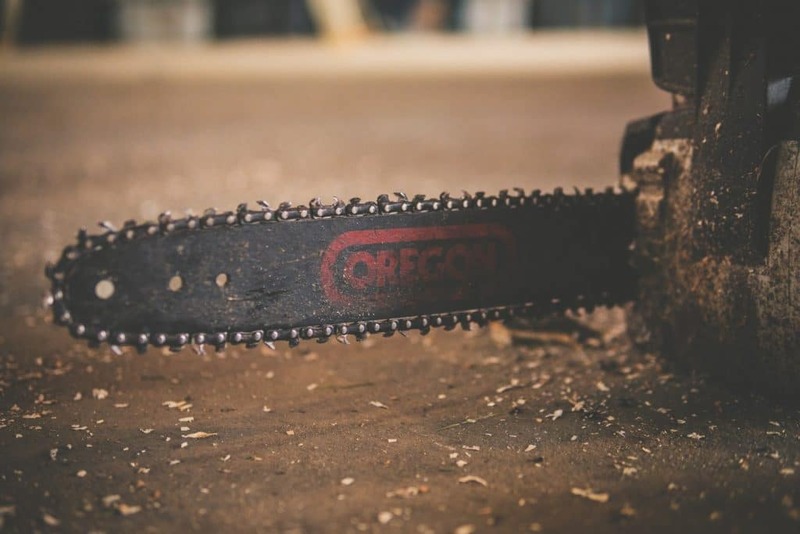 I hoped this article helped you pick the right chainsaw. I was a little hesitated about buying an electric chainsaw after using a gas powered one for many years. But just like with cars, the technology keeps getting better and electric is now the way to go. Electric chainsaw require in the beginning a lot of oil, so make sure you buy that as well when you get your new chain saw. If you have any questions or suggestions, just drop a comment below.